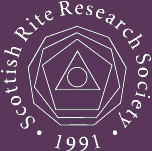 The Scottish Rite Research Society® (SRRS) was formed on May 8, 1991, when fourteen Scottish Rite Freemasons were granted a charter by the Supreme Council, 33°, S.J. The administrative offices of the SRRS are at the House of the Temple in Washington, D.C., under the Supreme Council of the Scottish Rite. Activities and publications of the Society are governed by a Board of Directors, who are all Life Members of the Society, representing Scottish Rite valleys across the country. Since its formation in 1991, the Society has become one of the most dynamic forces in contemporary Masonic research, pursuing a publication program that emphasizes quality—both in content and in physical form. The Society has grown to over 4,000 members worldwide since inception. Its publications have redefined the standards of Masonic scholarship. Anyone who is interested in deepening his or her understanding of Freemasonry would benefit from Society membership. One need not be a member of the Scottish Rite, or even be a Mason, to join the SRRS. Life Memberships are available by visiting our membership page.